Each year as I put up my Christmas tree, I am reminded of the extended family that has been created within the walls of my classroom. 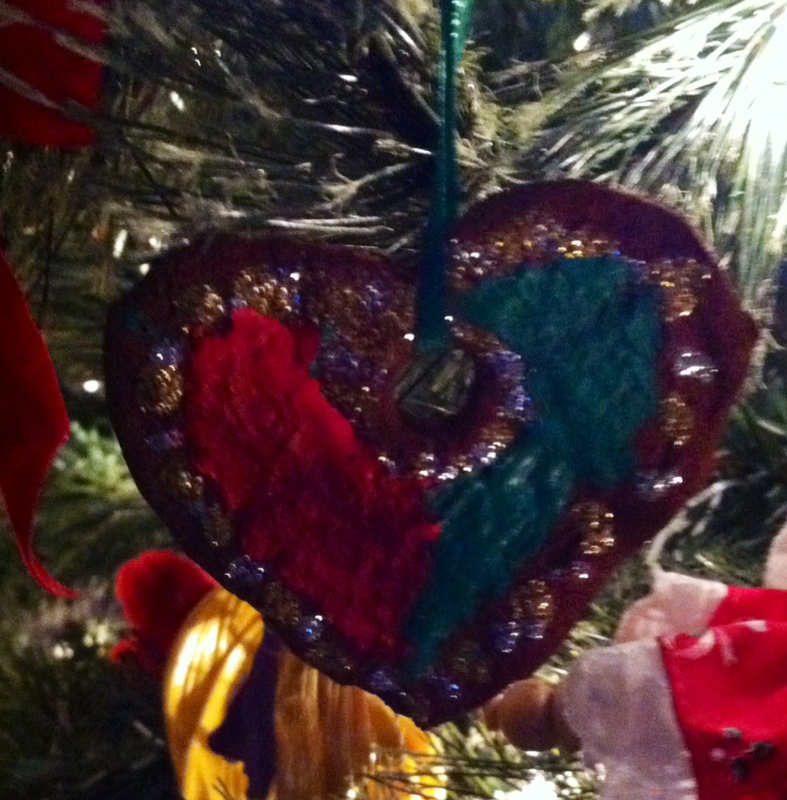 As I hang the small, handmade ornaments from former students, stories from the past come flooding back to life. Each ornament comes with it’s own tale and I fondly reflect back to the day that they were presented to me. These little hands come bearing gifts that they are so proud of. They smile and beg me to open their tiny treasures. It is a magical moment when the paper has come off and their gift has become unveiled to me. You can see the gleam in their eyes! I don’t know if my students realize that years later, I can still remember those moments. I don’t know if they realize that It wasn’t really about the gift or the ornament, it was about the connection and imprint they made on the life of our class. What I am sure of though is when I am unwrapping these little packages, what I am really unveiling is the heart of a child. In August it seems that I am always asked by my non-teacher friends, “When do you go back to school?” I know they are expecting me to answer back like it is a death sentence. I understand why they would think that. Besides who wouldn’t like to have ten weeks of being on your own schedule! This year it is different. My daughter is counting down the days till she can return, my husband is already in his new classroom excitedly preparing for high schoolers, and I just found out that my second Donorschoose project has been fully funded. School starting is a celebration in our house and I can’t wait for this year to begin! A year ago I found out about the amazing power of the Twitter world. I used to think it was to follow tv shows, movie stars, and sports teams. I didn’t have time for that kind of social media. I attended a conference where Chris Lehman was speaking about his book “Energize Research, Reading, and Writing”. During the conference he was showing the audience his Twitter feed and how we could use the hashtag of the day to discuss his presentation. I was immediately hooked and began connecting with educators all over the world. I found out about edcamps, Donorchoose, 3D printers, makerspaces, blogging, and the power of having a PLN. These did not exist in my world a year ago. SEPTEMBER 2ND IS ALMOST HERE AND I AM NOT ALONE! I’ve never been more excited for the year to begin! I know that it will be fantastic. Yesterday was our last day of school, a day that most students come full of excited anticipation of that final bell. That bell would mean summer was finally here! There would soon be sleepovers, gaming time, and adventures with family. My kids were no different. We filled our morning with fun and laughter as we participated in team building activities, shared our summer plans, and ate hot dogs and ice cream. Suddenly, the day slipped by and it was time for our year to close. We gathered together in a circle to say goodbye. I saw eyes flip back and forth to the clock. Would that bell ever ring? We crossed over our hands and passed a friendship squeeze around the group. That’s when it happened. Usually the squeeze passes very quickly, but as they passed it from hand to hand, I saw tears instead of smiles. They meant something to each other! They were more than a class, they had become a family. The bell rang…. my kids stayed, hugging, crying, remembering. That bell can be bittersweet sometimes. While one group of students are investigating the 3D printer, I have another group exploring yet another technological territory. It started two years ago when one of my boys found a program called “Scratch“. He tried to tell me about how you could learn to code by using it. I was not willing to investigate computer programming back then. I saw it as “game-playing” and failed to see its educational value. Lucky for me, this student persisted and continued to produce “games” for others to play. It wasn’t until I saw the Hour of Code website that I finally understood what he saw as game playing, could be turned into mathematical thinking and problem solving skills. I told him that he could start teaching the class. He was beyond ecstatic! Within a day he created a Google Slide presentation and used morning meeting time to teach my entire class how to code. The students who are intrigued by learning how to code have created a team. They work together during recess to produce, collaborate, critique, and learn to create new code. While some of their projects have focused on school topics such as simple machines and Ancient Greece, other games have been made for birthday presents, fun, and competition. One of their recent games, “Wipeout” , was the featured game on the Scratch site receiving over 39,000 hits. The Scratch team has presented at our talented and gifted committee and were invited as presenters to a local elementary school career day. Together they ran four sessions to teach about 60 lower elementary children how to code. The excitement we all felt was beyond words. I know we are onto something here! All it took was for one boy to “Scratch” the surface. With the new 3D printer up and running we had another challenge to face. How on Earth do you make something of your own? I posed this question to a few of my students and they ran with it. They looked at Design Something and 3Dtin. Both programs were accessible with a Chromebook and accounts could be created with their Gmail. They played with the options on their own and found that 3Dtin was easier to learn. They wanted their first creation to be a nameplate for my table. They figured out how to design one and quickly learned how to manipulate x, y, and z variables to create their vision. These kids showed me their design and begged me to print it. I was struck by fear once again! I had no idea what I was doing. There was no formal lesson plan, just a spark that had ignited a fire of self-directed learning. The old question of, “how does this fit into curriculum?” came lurking through my mind. Do I really have the time to set aside to help these children build a nameplate? The pile of uncorrected work mounted on my table reiterated the negative thought pattern that was brewing within me. Everyday they asked me if we could print their design until I finally caved in, took a deep breath, and learned how to import their design into Makerware. It was time to hit print once again. The build was to take over an hour. The boys who created the nameplate gave up lunch and recess and we watched the printer build layer by layer. We were in a state of disbelief as we saw letters begin to form. We were confident that the build was going well. 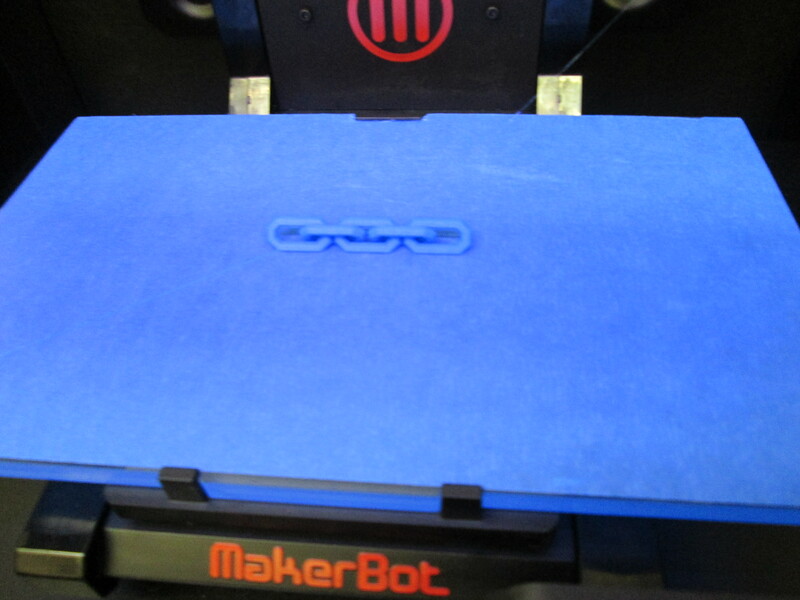 I stepped out of the room, the boys left for another class, and I returned to a frozen Makerbot! Ughhh! How could this have happened? It must be the Makerbot’s fault, or so I thought. I waited until the kids came back and broke the news that their design was not meant to be. Problem solving was the furthest thing from my mind. However, my kids knew better. One of them came up with the idea to print a pre-made design again. If it worked, it would prove the Makerbot was not the problem. If it didn’t work, we had bigger issues. The pre-fab design printed in perfect perfection. The kids kept brainstorming and took a look at their design. I started to look at what had happened too. After 24 hours I realized that my computer had gone to sleep ending the communication to the printer. Human error had caused the disruption. The spark was ignited once again and we were all on board to go for the first real build…take 2. 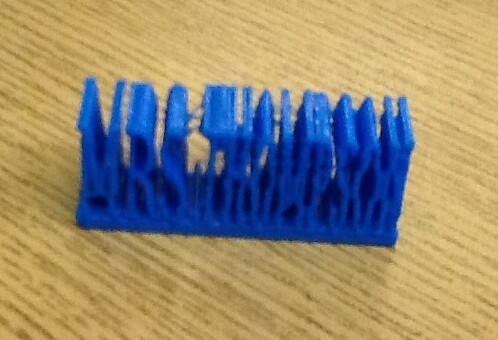 This time we learned how to resize the design so that we could print a smaller version. That way if it failed, it wouldn’t be long before we could find out why. We had success. My nameplate came out perfectly…mini-size. 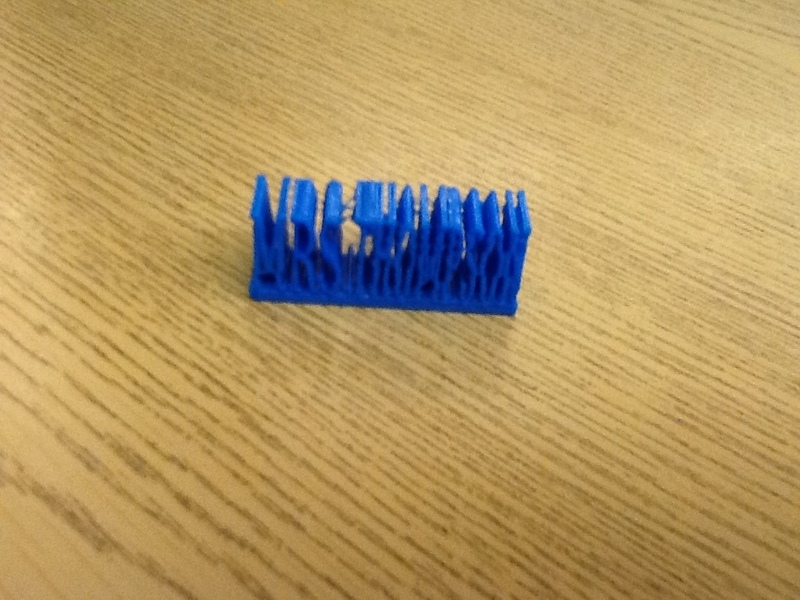 The lesson I wanted my students to learn was how 3D printing software worked. I guess sometimes the best lessons come from the unexpected. We have all learned that we must always remember to try and try again! After 17 years of teaching, I feel like I am just beginning to find the surface of hidden potential within my students. For years I have taught curriculum by making sure kids can understand math concepts, historical events, and more recently scientific theories. I have taught life skills by helping kids to learn how to solve problems, get along with others, and the importance of kindness. So why do I now feel like I have just arrived? This year I see sparks! I have entered another dimension of teaching I never thought possible. Through Donorschoose.org I wrote a project to aquire a 3D printer. I thought it would take months to fund this project. However, within 6 days, the project was fully funded. I had the printer two weeks later. The excitement grew among my students as we stared at the unopened box. I was afraid to begin. The students asked me almost every hour about when we would open it. It sat for days as an ominous threat to my teaching career. What if I failed in front of my class? What if I wasn’t capable of getting the $2400 gift to my class up and running? What if it broke? With some soul searching I decided to grab the bull by the horns and go for it. If I was to fail, I would use it as a “teachable moment” in learning from mistakes. Together my kids took the printer out of the box, set-it up, and rearranged my class to find the perfect spot. A day later we hit “print” and we stared in wonderment as the printer hummed quietly and a comb appeared before our eyes. We didn’t fail!! We succeeded! Could we repeat it again? We tried with another pre-designed item and a shark magically transformed from melted plastic. That’s when it happened…there were sparks everywhere! I felt it in my heart. I saw it in their eyes. I heard it in their conversations. Suddenly the impossible dream, became a reality. They knew they were into greatness and so did I.